Are your hardwood floors in need of cleaning in Birmingham, AL? If so, Heaven’s Best Carpet Cleaning can help. Along with cleaning carpet and rugs, we also clean hardwoods and tile. We use unique cleaning and polishing solutions specially designed for cleaning and polishing hardwoods. Our Hardwood Floor Cleaner is a unique product formulated to clean, condition, and protect all types of hardwood floors. Our products and polishing process will help extend the life and improve the appearance of your wood floors. Once cleaned, we polish your hardwoods so they will look like new. Depending on the traffic, hardwoods should be cleaned 1-4 times a year. But before we clean any surface, we commercial vacuum it with one of our top of the line commercial vacuums or commercial back-pack vacuums. Vacuuming and sweeping is an important step in cleaning carpets and hardwoods. They now have vacuums on the market that are safe to use on hardwoods. Some vacuums that are not meant to be used on hardwoods can scratch or scrape the wood. So, before using a vacuum on your hardwoods make sure it is safe to use on them. If you don’t have a vacuum that can be used on hardwoods, the next best thing you can do is sweep or dust-mop your hardwoods regularly. Sweeping your hardwoods regularly can protect against scratches and damages created by pebbles and dirt that may get trapped in your home. 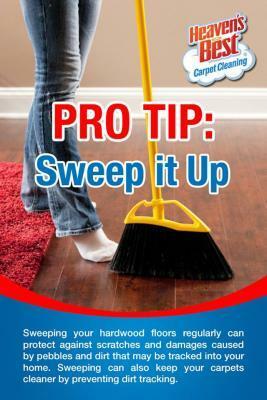 Sweeping can also keep your carpets stay cleaner because it prevents dirt from being tracked onto them. If you sweep regularly and your hardwoods still look dull and scratched, call Heaven’s Best at (205) 618-9150. We can bring shine and luster back to them. Let the Heaven’s Best professionals help with your hardwood floor cleaning in Birmingham AL, so your floors will shine all year long.